[198 Pages Report] The global bioethanol market was valued at USD 52.66 billion in 2016 and is projected to reach USD 68.95 billion by 2022, at a CAGR of 5.3% between 2017 and 2022. Bioethanol is used in fuel blending, alcoholic & non-alcoholic beverages, food aroma, cosmetics, pharmaceuticals, inks & paints, and power generation. 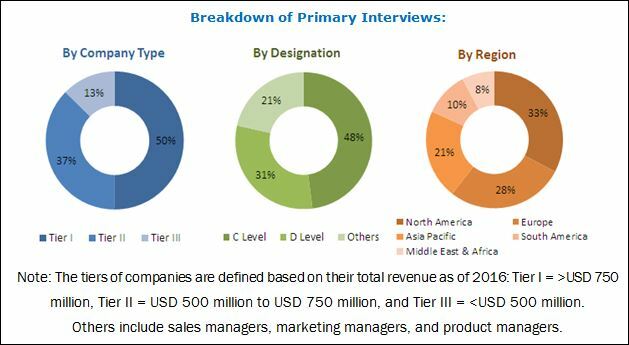 The bioethanol market growth is highly dependent on the transportation fuel market growth as transportation fuel accounts for approximately 90% of the overall bioethanol market. The bioethanol market for fuel blending is driven by government policies & mandates, increasing biofuel usage to deal with volatile prices of crude oil, raise awareness on climate change, and increase in demand for higher octane rating at a competitive cost. Increasing competition from other oxygenates or octane improvers and increasing demand for electric & hybrid vehicles are the factors which are likely to restrain the bioethanol market growth. With the increasing percentage of bioethanol in blended fuel, the dependency on gasoline will reduce and be less vulnerable to transportation fuel price fluctuations. For example, if 85% blended fuel is used in transportation; the dependence on gasoline will only be the remaining 15%. Similarly, if 100% bioethanol is used as fuel, the transportation sector will be independent of gasoline and its price fluctuations. Both top-down and bottom-up approaches have been used to estimate and validate the size of the global bioethanol market, and to determine the sizes of various other dependent submarkets. The research study involved extensive use of secondary sources, directories, and databases, such as Hoovers, Bloomberg, Chemical Weekly, Factiva, and other government and private websites to identify and collect information useful for a technical, market-oriented, and commercial study of the global bioethanol market. Some of the major players in the bioethanol market include Archer Daniels Midland Company (US), POET LLC (US), Green Plains (US), Valero Energy Corporation (US), Flint Hills Resource (US), Abengoa Bioenergy SA (Spain), Royal Dutch Shell plc (Netherlands), Pacific Ethanol, Inc. (US), Petrobras (Brazil), and The Andersons (US). This research report categorizes the global bioethanol market based on type, application, and region. The global bioethanol market is expected to reach USD 68.95 billion by 2022, at a CAGR of 5.3% from 2017 to 2022. In terms of volume, the market size is projected to reach 146,999.4 million liters by 2022. The growth of the bioethanol market is driven by the government policies and mandates an increase in awareness about climate change and greenhouse gas emissions. Bioethanol is ethyl alcohol derived from the fermentation of different renewable sources such as corn, wheat, grain sorghum & sweet sorghum, cassava, barley, potato, sugarcane, sugar beet, and cereals. Although ethanol can also be produced as a by-product from a chemical reaction with ethylene and other petroleum products, these chemicals are not renewable sources and, therefore, it is not considered as bioethanol. Bioethanol is majorly used as a fuel substitute for petroleum fuel. Bioethanol fuel is eco-friendly. Bioethanol has significantly lower emissions than coal and gasoline which harm the environment. Apart from fuel, bioethanol is used in alcoholic beverages, pharmaceuticals, and cosmetics. 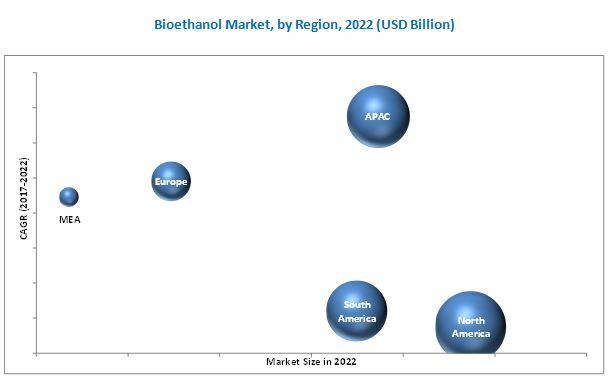 The starch-based feedstock type segment accounted for the largest share of the bioethanol market and is expected to continue to be the largest segment throughout the forecast period. Starch-based bioethanol uses corn, barley, wheat, and other starch raw materials as feedstocks to produce bioethanol. However, the cellulose-based type segment is the fastest growing segment owing to the inedible feedstock used in this feedstock type. The growth in consumption of bioethanol in transportation fuels has increased the demand for different blending types. In 2016, the E10 blend segment accounted for the largest share of the global bioethanol market. However, E75 to E85 blend type is expected to be the fastest growing blend type segment. The growth of this segment is attributed to the increasing number of flex-fuel vehicles. North America accounted for the largest share of the bioethanol market in 2016. Increasing government and environment regulations in the region act as key growth drivers for the bioethanol market in this region. However, Asia Pacific is expected to be the fastest growing market for bioethanol. The high demand for bioethanol in the Asia Pacific is attributed to the demand for alcoholic beverages from countries such as China and India. This factor is driving the growth of the bioethanol market in this region as both these countries have the world’s largest consumer base in terms of population. The transportation sector accounts for a significant share of approximately 14% to 20% of the worlds CO2 emission. Producing and using bioethanol fuels can help reduce CO2 emissions significantly. This will result in saving ample amount of CO2 content of fossil fuels in storage. Apart from these environmental benefits, bioethanol fuels also provide economic benefits. Most of the existing vehicles running on gasoline fuels are compatible with a low percentage of blended bioethanol fuels. For higher bioethanol blends up to E85 or E95, minor modifications are needed in vehicle engine and infrastructure. Owing to this, many new vehicles are already manufactured to be compatible with higher bioethanol blends. Bioethanol is used in the production of alcoholic beverages in the form of undenatured bioethanol as the alcohol is intended for human consumption. Bioethanol is used in different alcoholic beverages such as vodka and gin. The neutral alcohol is mixed with water, aromas, and flavorings to produce the final product. The alcoholic beverages industry is estimated to grow at a moderate pace. The growing acceptance of drinking alcoholic beverages in some cultures is the key growth drivers of the alcoholic beverages industry. Bioethanol is used in the cosmetics industry in denatured form. They are used in many personal care products such as makeup, lotions, perfumes, oral care, skin care, and hair care products. Bioethanol is used as an antifoaming agent in cosmetic products. They are used in perfumes and deodorants as they have a very neutral odor and act as excellent carriers of fragrances. Owing to their antibacterial property, bioethanol is used in many skin care products. They act as an astringent to clean the surface of the skin and remove germs. Bioethanol is used as a bio-solvent in the pharmaceutical industry. It is used in different medicines. In antiseptics and disinfectants, it is used as a solvent as bioethanol kills germs and organisms by breaking their proteins. It can be found in most antiseptic products such as sanitizers and medical wipes. Bioethanol is also used in blood/plasma fractionation; it is used to separate proteins such as cryoprecipitate which contains factor VIII and factor IX, which are used in hemophilia treatment. 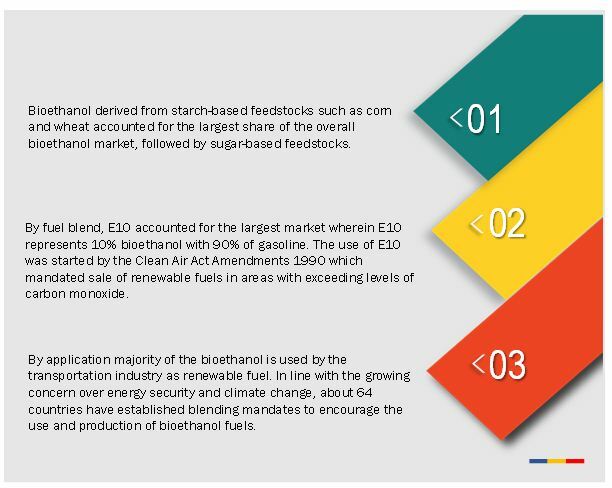 Which are the blending mandates of bioethanol? How other alternatives have an impact on bioethanol? The increase in acceptance of electric vehicles and ban on internal combustion engines in different countries may affect the growth of the bioethanol market. For instance, France is planning to ban all gasoline and diesel vehicles by 2040 in line with the government’s plan to make the country carbon neutral by 2050. All these factors might restrain the bioethanol market growth. Companies have adopted strategies such as mergers & acquisitions, expansions, and joint ventures to enhance their market shares and widen their distribution networks in the bioethanol market. These companies engage in research & development activities to innovate and develop products that can open new avenues of applications. For instance, Praj Industries, using the Praj Advanced Cellulosic Ethanol (PACE) technology, is planning to establish a demo plant for cellulosic ethanol production. Similarly, CropEnergies AG is also developing technical concepts for processing of lignocellulosic raw materials. Likewise, POET LLC, in partnership with Royal DSM (Netherlands), opened a commercial scale cellulosic ethanol plant in Iowa, US. The plant uses corn crop residues such as cobs, leaves, husk, and stalks as feedstocks to produce cellulose-based bioethanol.